Annie ~ Our blessing after being involved in a scam. Annie with her beautiful long coat. Annie's one and only hair cut! There is a long story behind our Coton de Tulear, Annie. I will shorten it tremendously as follows. We were looking for a puppy on a website that was 'supposed' to help you find the perfect puppy for you. 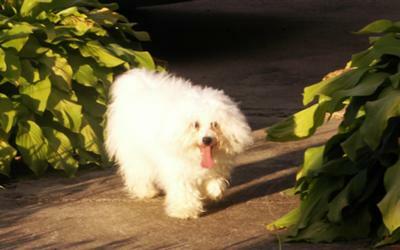 I stumbled across a picture of a dog that I fell in love with; it was a Coton De Tulear. I did research on the breed as I had never heard of it before. After doing research I decided it was exactly what I was looking for. Upon contacting the person with the ad their response to me went something like this: I am so glad you are interested in this puppy. It was bought by a previous customer of mine who is a missionary and has been sent to Nigeria on a missions trip. He took the puppy and has contacted me saying the puppy is miserable there because of the heat. He said if I can find a good Christian home for the puppy he is willing to give it to the family for just the cost of shipping him back to the U.S. The lady gave me contact information for a "Rev. Peters" and he and I talked several times over the phone, supposedly from Nigeria. I decided I definitely wanted little "Quincy" as he called him and wired him the money he asked for. A short time after wiring him the money he called and needed an additional $400 for insurance of safe arrival. Once Quincy arrived safely in the U.S. the money would be refunded. It was then I began doing my homework.... It was too late. The money I had wired was gone, there was no such dog named Quincy and the lady with the ad had disappeared. I began looking locally for a little dog I had never heard of and in a short amount of time found little Annie in Indiana. She is spoiled beyond spoiled but I wouldn't have it any other way. She is a joy! Comments for Annie ~ Our blessing after being involved in a scam. I purchased Annie from an Amish man just outside of Richmond. Annie was from his first litter of Cotons and the litter was just two females. Thanks for asking. Were did you find little Miss Annie? If you don't mind my asking... I live in Indiana, and was just wondering. 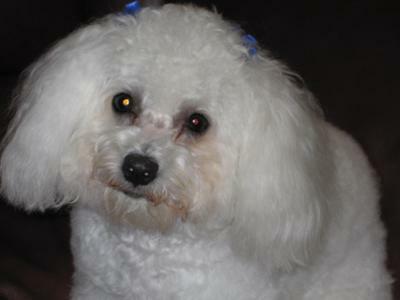 I to have a coton & Love my Ziggy ~Doodles very, very much!!! Re: How old is Annie? Annie turned two Sept. 29, 2010. Thank you for reading our story! Thank you so much for sharing your story. Hopefully you will be helping others from making the same sad mistake. I'm so glad your story has a happy ending. Annie is beautiful! Annie is soooo cute. She is lucky to have you and Roy to love and take of her.